This paper describes the results of experimental investigations the possibilities of the method of synthetic aperture for the microwave imaging the internal structure of small thickness concrete walls. It is shown, that with proposed modifications this method can show the presence the air cavity at the depth about 5 cm at the concrete wall with thickness 15 cm. Determination the structure of optical opaque object is very important task of nondestructive testing. Among such problems are the inspection of highway and bridge decks, detection of cavities behind concrete tunnel linings, detection, quantification of local scour around bridge piers and testing of structural concrete elements such as beams, columns and walls. Radar technique, also known as Ground Penetrating Radar ( GPR ), is most applicable for such cases. But in most GPR are used the pulse method which alongside with conclusive advantages, have also shortages, one from them is a complexity of obtaining the high resolution on depth, that hampers the testing by this method the concrete walls of a small thickness. Earlier was shown that for step-frequency continuous signal microwave radars additional spatial measurements allow to determinate separately inhomogeneities depth and dielectric properties of testing object  and improve accuracy of reflectors depth determination in dielectric media . In the given work is considered the application of multifrequency synthetic aperture imaging for the determination the structure of a thin concrete walls by the means of step-frequency microwave radar. Fig 1: Geometry of synthetic aperture system for the case of concrete wall. where S(xn, wk) - signal measured at position xn and frequency wk, n - speed of light at tested object . Now if we store the frequency dependence of reflected signal at some points along the surface of tested objects (Fig.1), then by (1) we can determine the inner structure of objects. Fig 2: Depth distribution of reflections, calculated on experimental data. On Fig.3. presented the reflection distribution, calculated after such background subtraction. It is obviously, that level of noise reflections there are less, than on Fig.2. but the width of main peak, that corresponds to metal rod, is enough big. It is because of frequency property of used antennas. To overcome this we implement preliminary calibration measurement, at which the antennas are directed into a free space and then the received signal are stored. After this all next measurements normalized on a signal on appropriate frequencies for a free space. Such method can be used only with continues wave step-frequency radar, that is one of advantages of such device against impulse radars. The results of this operation can be seen from Fig.4. The width of main lobe became less, but noise also increase. So this method can be applied for the case, when necessary good accuracy in determining the depth of inhomogeneities in the testing objects. 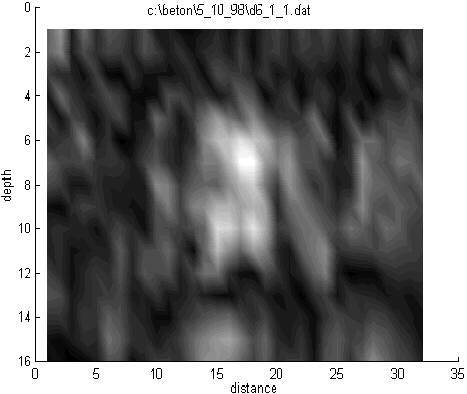 Fig 4: Depth distribution of reflections, calculated on experimental data after normalization on free-space signal of used antennas. The presented data show, that the method of synthetic aperture with proposed two-steps correction of received signals can be applied for determination of internal structure of concrete walls of small thickness. We also investigate the internal images of concrete walls with air cavity insight it at different depthes (Fig.5.). On this images the cavity can be seen very good and we can determine the depth. On the left image the depth of inhomogeneities inside objects is about 7 cm, but there is a high level of noise. The right image is clearer and the depth of cavity can be evaluated as 10 cm. Real depth of inhomogeneities on these concrete objects was 5 and 8 cm. The difference between real and evaluated depth is explaned by a wrong a priory choise of the speed of light n in tested objects. For determination the real (geometric) depth we must know the permittivity of objects. It can be done as was shown in . Fig 5: Depth distribution of reflections, calculated on experimental data for test specimen of concrete with 2.5 cm air cavity on different depths from the surface ( 5 cm and 8 cm). 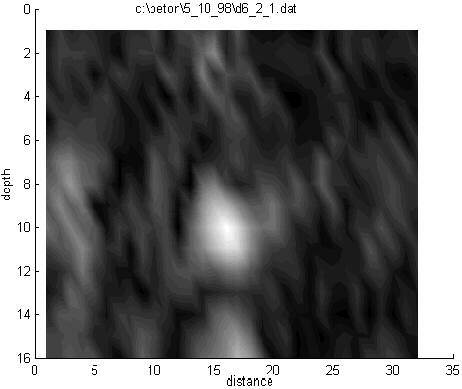 The experiments with other objects also shows, that quality of received image (level of noise) also depends on the space interval between points of mesurements Dxn=xn-xn-1. The optimal interval is depends on the frequency band of used signal and maximal depth of inhomogeneities in tested objects. So, on Fig.5. is different level of noise for the same experimental condition. The interval of 0.5 cm is optimal for depth 8 cm and frequency band 2-4 GHz. An efficient algorithm for near-field synthetic aperture radar imaging has been presented. The basis of the presented approach relies upon the use of two-steps correction of received signals for step-frequency continues wave radar, that include calculation the mean frequent dependence for the tested object and free space signal for used antennas. As an example, the images of concrete walls with metal rod and air cavity on depthes 5 and 8 cm are presented. The results obtained reveal the feasibility of this method for microwave imaging of concrete walls. G.Deshchenko, "Step-Frequency Microwave Testing of Concrete Walls", Proceedings of the 7th European conference on NDT ( 7th ECNDT) 26-29 May 1998, Copenhagen, Denmark, p. 868-871. G.Deshchenko, "Depth resolution improvement in the microwave testing of lossy dielectric media", Proceedings of the 2nd International Conference on Computer Methods and Inverse Problems in Nondestructive Testing and Diagnostics, 20-23 October 1998, Minsk, p.465-468. M.B.Kagalenko, W.H.Weedon. Comparison of Backpropagation and Synthetic Aperture Imaging Algorithms for Processing GPR Data. IEEE-AP Symposium, 1996. p. 2179-2182.